VANCOUVER, BC--(Marketwired - November 07, 2016) - UEX Corporation (TSX: UEX) ("UEX" or the "Company") is pleased to announce radiometric probe results from the first holes completed on the Ken Pen Deposit at the Christie Lake Project (the "Project"). The following Radiometric Equivalent Grade ("REG") results are from five of six holes targeting the Ken Pen Deposit, the second of the two known deposits located along the Yalowega Trend, a 1.5 km long uranium mineralized segment of the P2 fault corridor located on the Christie Lake Project (see Figure 1). 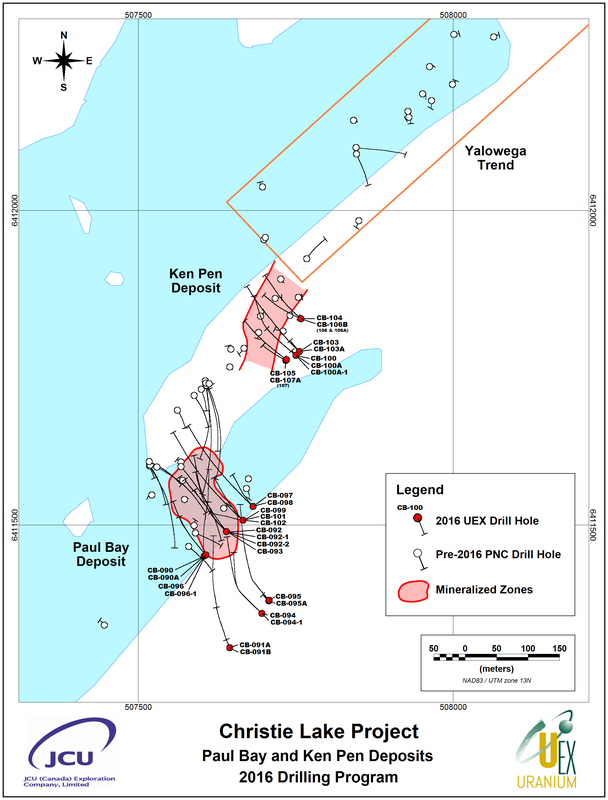 The Ken Pen Deposit is located less than 200 m northeast and along strike of the Paul Bay Deposit. "Our 2016 drill campaign has been a huge success. We have significantly expanded the Ken Pen Deposit footprint and it remains wide open for further expansion. This program confirmed our concepts and validated our exploration approach. I am excited that we uncovered new and unexpected exploration potential and I'm looking forward to seeing the drills turning again in January." UEX currently holds a 10% interest in the Christie Lake Project and is working under an option agreement to earn up to a 70% interest. The Project is located approximately 9 km northeast and along strike of Cameco's McArthur River Mine, the world's largest uranium producer. The P2 Fault, the controlling structure for all of the McArthur River deposits, continues to the northeast beyond the mine. UEX believes that through a series of en-echelon steps the northeast strike extension of the P2 Fault not only crosses the Project but also controls the two known uranium deposits on Christie Lake, the Paul Bay and Ken Pen Deposits. Technical information in this news release has been reviewed and approved by Roger Lemaitre, P.Eng., P.Geo., UEX's President and CEO and Trevor Perkins, P.Geo., UEX's Exploration Manager, who are each considered to be a Qualified Person as defined by National Instrument 43-101. UEX (TSX: UEX) (OTC PINK: UEXCF) (FRANKFURT: UXO) is a Canadian uranium exploration and development company involved in sixteen uranium projects, including four that are 100% owned and operated by UEX, one joint venture with AREVA Resources Canada Inc. ("AREVA") that is operated by UEX, as well as nine joint ventures with AREVA, one joint venture with AREVA and JCU (Canada) Exploration Company Limited, which are operated by AREVA, and one project (Christie Lake) under option from JCU (Canada) Exploration Company Limited and operated by UEX. The sixteen projects are located in the eastern, western and northern perimeters of the Athabasca Basin, the world's richest uranium belt, which in 2015 accounted for approximately 22% of the global primary uranium production. UEX is currently advancing several uranium deposits in the Athabasca Basin which include the Christie Lake deposits, the Kianna, Anne, Colette and 58B deposits at its currently 49.1%-owned Shea Creek Project (located 50 km north of Fission's Triple R Deposit and Patterson Lake South Project, and NexGen's Arrow Deposit) and the Horseshoe, Raven and West Bear deposits located at its 100%-owned Hidden Bay Project. JCU is a private company that is actively engaged in the exploration and development in Canada. JCU is owned by three Japanese companies. Amongst these, Overseas Uranium Resources Development Co., Ltd. ("OURD") acts as the manager of JCU. JCU has partnerships with UEX, AREVA, Cameco, Denison and others on uranium exploration and development projects in the Athabasca Basin of Northern Saskatchewan including Millennium and Wheeler River and the Kiggavik project in the Thelon Basin in Nunavut. This news release may contain statements that constitute "forward-looking information" for the purposes of Canadian securities laws. Such statements are based on UEX's current expectations, estimates, forecasts and projections. Such forward-looking information includes statements regarding UEX's mineral resource and mineral reserve estimates, outlook for our future operations, plans and timing for exploration activities, and other expectations, intentions and plans that are not historical fact. The words "estimates", "projects", "expects", "intends", "believes", "plans", "will", "may", or their negatives or other comparable words and phrases are intended to identify forward-looking information. Such forward-looking information is based on certain factors and assumptions and is subject to risks, uncertainties and other factors that could cause actual results to differ materially from future results expressed or implied by such forward-looking information. Important factors that could cause actual results to differ materially from UEX's expectations include uncertainties relating to interpretation of drill results and geology, additional drilling results, continuity and grade of deposits, participation in joint ventures, reliance on other companies as operators, public acceptance of uranium as an energy source, fluctuations in uranium prices and currency exchange rates, changes in environmental and other laws affecting uranium exploration and mining, and other risks and uncertainties disclosed in UEX's Annual Information Form and other filings with the applicable Canadian securities commissions on SEDAR. Many of these factors are beyond the control of UEX. Consequently, all forward-looking information contained in this news release is qualified by this cautionary statement and there can be no assurance that actual results or developments anticipated by UEX will be realized. For the reasons set forth above, investors should not place undue reliance on such forward-looking information. Except as required by applicable law, UEX disclaims any intention or obligation to update or revise forward-looking information, whether as a result of new information, future events or otherwise.